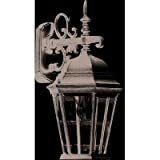 AC8421BK Finish: Black Features: -Outdoor wall lantern.-European style.-Clear glass.-Hexagonal shape. Options: -Available in black or rust finishes. Specifications: -Accommodates (1) 100W medium base bulb. Dimensions: -Overall dimensions: 18.25” H x 9.5” W x 10” D. Collection: -Tudor collection.